I made this a while ago, but never got around to posting the recipe, so playing a bit of catch-up. Made a few tweaks to the original recipe and I think it turned out quite well, although perhaps a little bit sweet. I think this was exaserbated by me serving it with sweet potato mash. Not a good idea. Next time I'll leave out the sugar and serve with plain mash (as the recipe suggests), or even polenta. 1. Preheat oven to 180 ºC. Arrange apples and onions in a roasting pan and sprinkle with sugar and caraway seeds. Pour orange juice over and sprinkle with olive oil, sea salt and pepper. Roast for 30 minutes, or until onion have softened. 2. 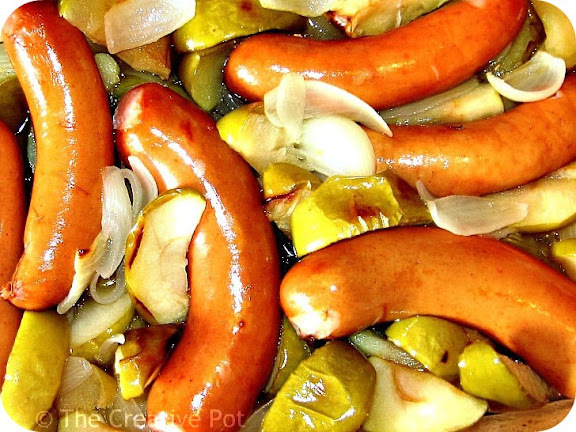 Add the sausage to the oven dish, spoon juices over and return to oven to heat through. Serve with mashed potatoes.